The winner of the Masters final and absolute winner of International Music Competition–Belgrade, Serbia 2018 became Clarinet Quartet “COLOR” (Oleh Malovichko, Izabela Žurczak, Sara Ślemp, Jarosław Srokak), students of Akademia Muzyczna w Krakowie , class of dr hab. Piotr Lato. 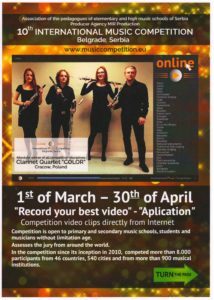 Clarinet Quartet “COLOR”, the winner of the discipline “Chamber ensembles” and the absolute winner of “Masters Final” ie. all contest nominations, received a cash prize and trophy. Mir Production with such a distribution of the prize fund helps talented young musicians, participants of the International Music Competition – Belgrade, Serbia 2018 in promoting their music career, professional growth and opens for them new horizons in the music world. Krakow, the cultural capital of Poland. 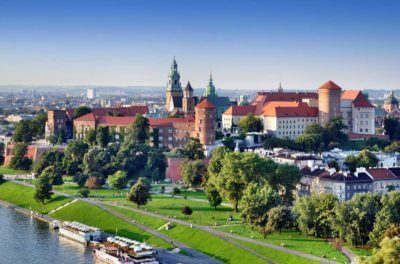 The full name of Krakow sounds like this: Capital city of Krakow. And he does justify such a solemn title. 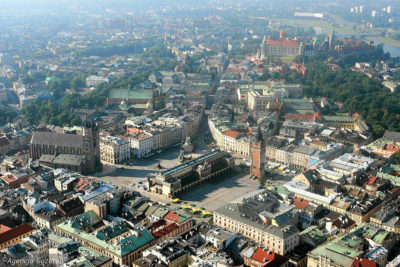 Despite the fact that this large city in the south of Poland has long ceased to be the capital, the dignity and beauty of the main settlement of the country remained in it. And the royal chic here at every step. Many tourists consider Krakow the most interesting place in Poland. People come here to see the sights, visit the impressive and horrific monuments of World War II and enjoy the amazing architecture of harmony. In addition, there are musical and film festivals, street theater days and other cultural events of a global scale.